On first perusal of the contents, I realized that the entire book was written in letters. I reminisced with heartwarming thoughts of one of my favorite children’s books The Jolly Postman and Other People’s Letters. Oh was I in for a treat. The Guernsey Literary and Potato Peel Pie Society ended up being historical (my FAV!) set in France and England just after WWII. The story involves a writer and all of the unique and utterly unbelievable people with whom she corresponds. I cuddled with every jot and tittle. Now I yearn to travel to Guernsey to see the steep shores and the stone houses and the green countryside. The creativity dreamed up for these folks in horrible times was amusing and very well written. My interest was held until the last page was turned. 2013… NEXT YEAR the movie will appear on the big screen for me to love all over again. Mom, we’ll have to go on opening day just like we did for The Help! The fires in Yosemite are still burning but the wind has shifted and we saw Lake Tahoe again today… even the east shore. We aren’t feeling quite as “smoked” today and ventured out in the boat. We dragged the kids around on a tube, which is really a game for the boat driver…. not the tube rider. Figure eights make me laugh…. hard. Well, when I’m not on the tube. Every single blinkin’ time I ride in a boat on a lake I’m transported back to my teen years and water skiing on Anderson Reservoir above Morgan Hill, CA. We always ate Arby’s beef n’ cheddars before we went and chewed wads of Hubba Bubba on the way. 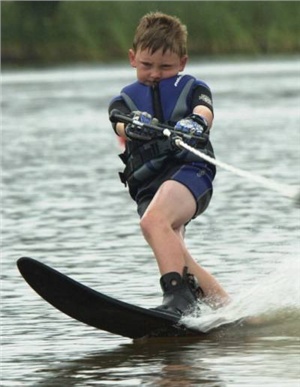 It revives my dream of having a boat and teaching all of our kids to water ski. I’m sure it kept me out of trouble… as it will them. Some day. Bags for Zaza has FIVE new bags posted this week raising funds for our adoption. There is a darling pink surprise that was made from a NEW pattern. Nothing but surprises over there. 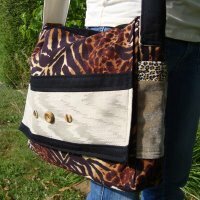 www.bagsforzaza.blogspot.com. And how is THAT news from Tahoe, you ask??? I got three bags cut out yesterday AT Lake Tahoe for next week. And I was going to be all creative and make an animal print bag next week, but Jennie beat me to it and posted one yesterday. It makes you want to roar and fluff your mane. Check it out. The Shack. I’m fighting my way through the book. I’m having a hard time with God being a fat black woman. But my sister tells me that the guy in the story, Mack, had a problem with a white grandfatherly God, so she’s black and all that. I’m drawn back to the book over and over, in hopes that it will grab my interest in another way. My detailed book report with a ___ out of 10 star rating will follow. Right now it’s leaning toward 3. He does have flowery, imaginative verbiage, but the split infinitives are driving me crazy. My apologies to W.P. Young. We head home tomorrow. It’s sad, I know. However the week was jammed full of the Settlers of Catan game that has become a new family fav. Seriously, with two games in the house we probably played at least ten times. I think what makes the game so enthralling is that it is different every single time. The game board changes. The shortage of building supplies changes. The probability of the numbers being rolled on the dice changes every time, yet we still place out settlements according to the red numbers of high chances. I think were grasping at an unattainable reality, but hey, it’s FUN!